In the previous post, we've studied the rifling for breechloaders. We also studied polygonal rifling earlier. We will now study some basic terms before we go on to some manufacturing technologies for rifling. 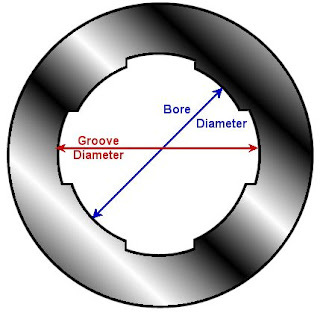 Groove diameter - This is the diameter of the barrel also considering the depth of the groove. The above picture assumes a traditionally rifled barrel (i.e.) a barrel which is circular in cross-section with grooves cut into it. In the case of a polygonal barrel (let's say it is a hexagon in cross section), there will also be a minimum width and maximum width. The minimum width is the distance between two opposite sides and the maximum width is the width between opposite edges. Because there are two different diameters in a rifled barrel, this sometimes complicates matters when expressing a rifle bore. The hugely successful Enfield .303 rifle that is still popular with railway security men in India is named that way because has a .303 inch bore diameter (i.e. 7.7 mm). However, if the groove diameter of this rifle is measured, it is actually 0.311 inches (i.e. 7.9 mm) in diameter because the groove has a depth of 0.004 inches on each side. Since it is a breechloading rifle, it fires a bullet that is slightly larger than the groove diameter of the barrel. The diameter of the bullets used by this rifle are usually 0.312 inches and when the gun is fired, the bullet gets slightly deformed as it enters the barrel and engages the grooves. Another term which we will encounter frequently is the twist of a barrel. This is basically a measure of how quickly the groove makes a complete turn in the barrel. For instance, in an AK-47, each groove makes one complete turn for every 237 mm. of barrel length, in a M16-A2 assault rifle, it is one complete turn every 178 mm. and so on. From this, we can say that a M16-A2 barrel has a tighter twist than an AK-47.